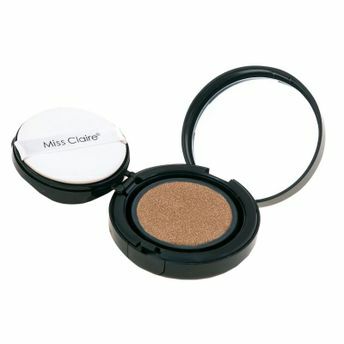 Miss Claire Magic Cover Cushion Foundation gives excellent coverage and a flawless, natural look. With buildable coverage, it conceals blemishes and ensures fresh skin with sebum control effect. Enriched with skin calming ingredients along with vegetable extracts and high reflective oil, the Miss Claire Cushion Foundation adds a natural, dewy glow to the skin. The rich nutrition of sweet almond oil and jojoba oil, and triple-water-lock system, leaves the skin moist and supple. Explore the entire range of Foundation available on Nykaa. Shop more Miss Claire products here.You can browse through the complete world of Miss Claire Foundation .Alternatively, you can also find many more products from the Miss Claire Magic Cover Cushion Foundation range.